The following is an activity which can be used as a in class assignment or assigned as an assessment activity. 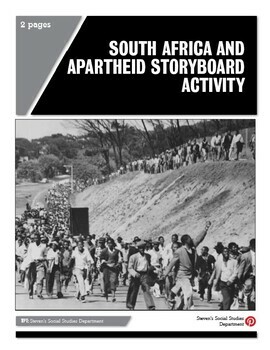 For this activity students are asked to create a separate "Storyboard" for four required topics (Background of South Africa, Apartheid Policies, Events and Backlash of Apartheid, and End of Apartheid). 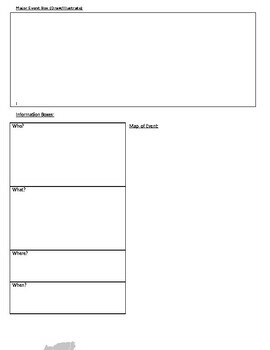 Each "Storyboard" has a prompt for students to use and clear instructions and requirements for students. Students are asked to "create an illustration, answer Who, What, Where, and When, and lastly label on a map of Africa where the event took place for each of the four required topics. 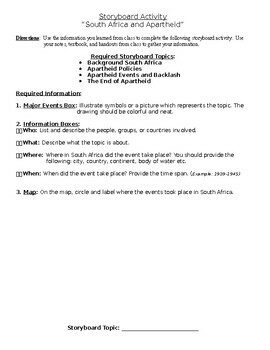 I usually use this activity after giving a PPT over Independence In Africa (available in my store) and after a discussion and handout on Apartheid.